The workshop will take place in the El Ati hotel located one hour from Moulay Ali Cherif airport in Errachidia city. Merzouga is a small village located in south-east Morocco, 100 kilometres from Errachidia, 45 kilometres from Erfoud, and 20 kilometres from the Algerian border. The dunes of Merzouga border the Erg Chebbi, a Saharan erg and it is for this reason a part of the itineraries of many tourists visiting Morocco. 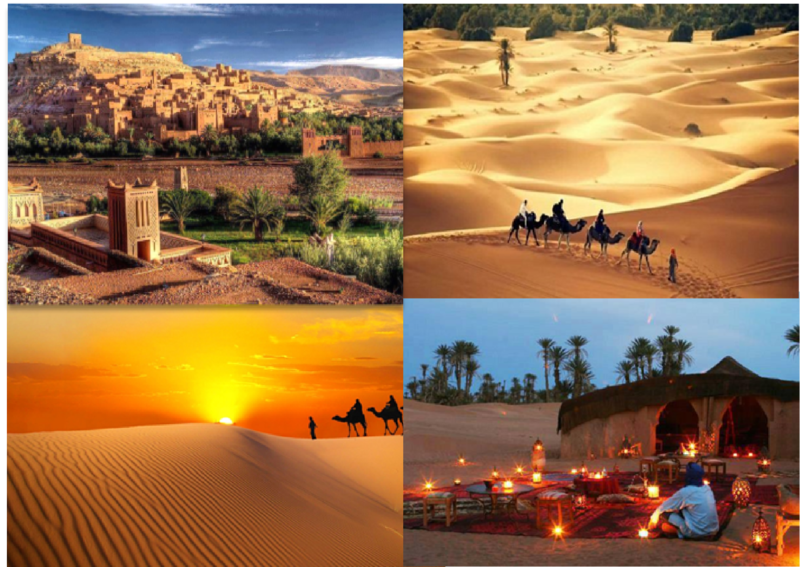 The Dunes of Merzouga, a wonder of nature, are one of the province’s proud tourists, the visitor is dazzled by these high eternal dunes and especially during sunrise and sunset, which remains a magical and unique view in the world. In addition, Merzouga sand is famous for its therapeutic properties against certain rheumatic diseases. Besides, the sand of Merzouga is famous for its therapeutic properties against certain rheumatic diseases. The months of July and August are indeed experiencing a craze among national and foreign visitors for sand baths, which are very beneficial cures. The climate in Merzouga is Saharan in nature, characterized by aridity. In summer, the temperature can reach 45°C, while in winter, it varies between 10°C and 18°C. The vegetation cover of the Merzouga region is made up of plants that can withstand heat, cold and water scarcity well. The main cultural event in the Merzouga region is the Erfoud Dates Festival. Not to be missed, the sunset and sunrise on the sand dunes of Merzouga.